If the water tap is left on while the drain stopper is closed, the opening will channel water down into the drain opening rather than letting is spill out of the sink onto the floor. The overflow allows the sink to drain faster by introducing air into the system. A standard sink overflow is a hidden channel running along the underside of the sink basin. You may not be able to see it from the top of the sink and often can't see it from below, either. At the top of the overflow channel, there will be one or two holes near the rim of the basin. The bottom of the channel has an outlet hole that lets water flow into the drain just below the basin. The basin and the overflow empty into the same drain pipe, but the overflow is always open and isn't affected by the sink stopper. If you close the drain of your bathroom sink and fill up the sink basin to the level of the overflow hole, the water will begin draining into the overflow opening and down the drain. 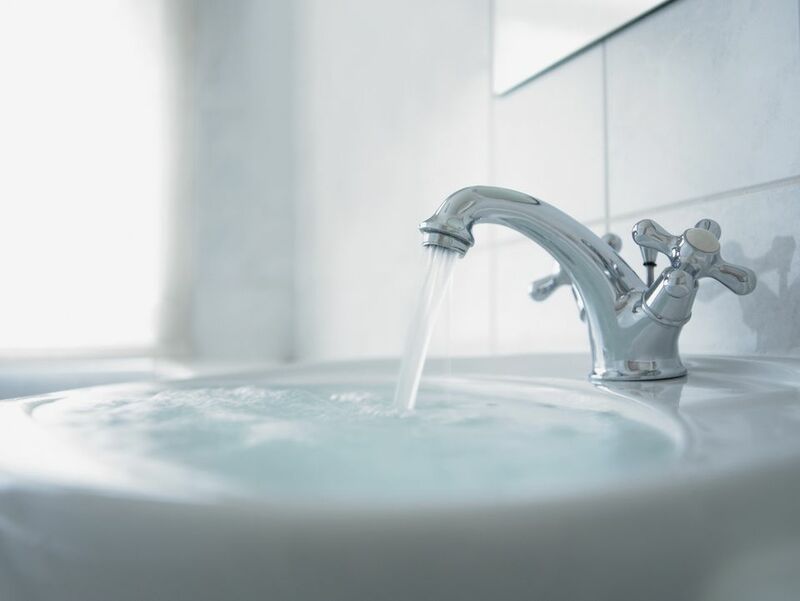 This helps prevent the water from spilling over the top of the basin, but because sink overflow holes are usually small, they may not prevent an overflow for very long. If the faucet is running at full volume, the overflow tube may just delay water from overflowing for a short time. It's a common misconception that the sink overflow prevents overflowing water in the event that the sink drain is clogged. But the overflow outlet on most sinks is very close to the drain opening in the basin, and it's unlikely that a clog can occur between the drain opening and the overflow outlet so that it clogs up the former but not the latter. A bathroom sink overflow really protects against overflow when the stopper is closed and the faucet is accidentally left running, not in the event of clogs. Overflow drains on bathtubs are a bit different and have more distance between the drain opening and the overflow connection. The overflow fitting on a tub can still work to prevent water from overflowing if a clog is close to the tub drain opening. The sink overflow helps the basin drain faster by allowing air into the drain pipe via the overflow channel. When there's enough water in the basin to completely cover the drain opening, the drain can't get air through the water, creating a suction effect that slows the flow of water going down the drain. But with the overflow feeding air to the drain pipe, the suction effect is reduced and the water drains much faster. By contrast, sinks that don't have overflow openings commonly send up bubbles as they drain, and they typically drain more slowly. Zip tie: Long plastic zip ties work very well because they bend around the curve of the sink but are rigid enough to dislodge any buildup. Insert the pointy end of the zip tie into the overflow opening and slowly work it down as far as possible. Move the zip tie up and down and side to side to loosen and push out any blockage. Be careful not to drop the zip tie into the overflow tube—a longer zip tie will be easier to hold. Rubber hose: Fill up the sink with water slightly higher than the overflow opening. Let some of the water run down the overflow. Put one end of the rubber hose against the overflow opening and blow several puffs of air through the other end. Drain the sink and blow air through the hose again. The air should blow through freely, without resistance. Repeat as needed. A 7/8-inch dishwasher hose works well for this, but any sturdy hose can work as long as it fits over the overflow opening. Liquid cleaner: Create a 50/50 mixture of chlorine bleach and plain water and pour the mixture down the overflow hole(s), using a container with a pour spout. Let the mixture sit for 10 minutes, then flush the overflow with plain water. Note: Do not use bleach if your home has a septic system; instead, use a commercial enzyme drain cleaner that is safe for septic systems. Mix the product as directed and pour it into the overflow hole(s). Let it sit overnight, then flush the overflow with water.